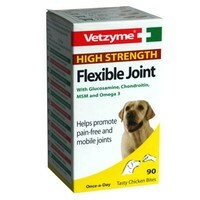 Vetzyme High Strength Flexible Joint Tablets are specifically formulated to help maintain pain-free, supple and mobile joints. They help to ensure your dog has a better quality of life as it enters it's later years. It can be ideal for senior dogs as well as all types of dogs and puppies over 12 weeks. Particularly, dogs prone to bad joint problems. Our vizsla who is 12 years old showed improvement within a week on 2 tablets a day, certainly will continue to give it to him! Ta. This has proved very effective with my 12-year-old Labrador. I have been using these tablets for years on both my GSD and Springer and feel they really do work to keep them fit and healthy. I'd tried several tablets for my 16 year old French poodle without much success and discovered these about 6 mths ago and can't believe the change, Oliver has got back the spring in his walk and joy for playing!! My dog has bad arthritis and he has been on medication from the vets for years but was finding it difficult to walk. He has been on high strenght vetzyme for 5months now; he can walk so well now and enjoys his walks. Very good tablets. I didn't think these were going to work but my 10 yr old German Shepherd had started having problems with her back hips (stiffness, not going up stairs, getting in and out of car etc) so I thought I would give them a try and was amazed. Within a week I had my old dog back.